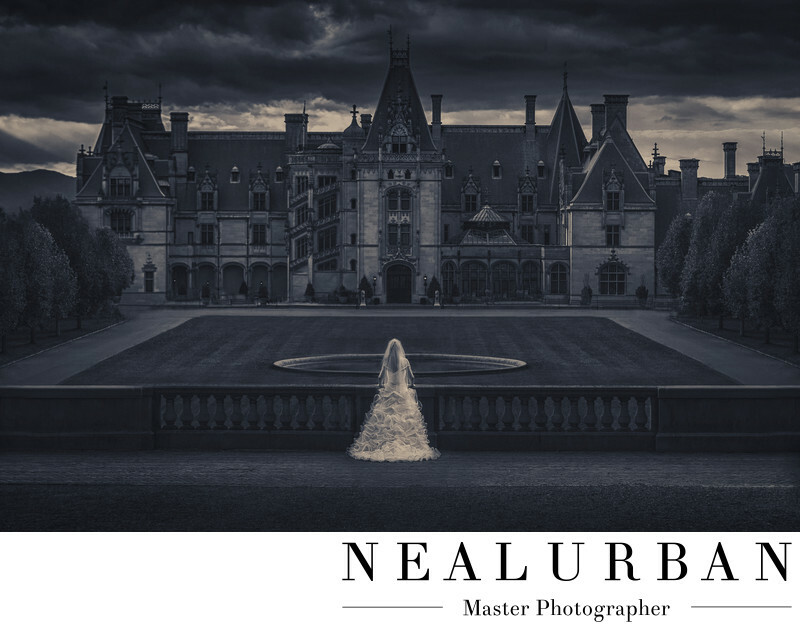 The Biltmore Estate in Asheville NC was a dream destination for Neal to photograph a wedding! That dream came true when Cheryl and Rob contacted us for the wedding. Cheryl grew up in that area and was having her wedding there. All of her family still lived that way and she knew when it was time to plan her wedding, the Biltmore was the location! And Neal Urban Studio was going to photograph it! Cheryl really wanted an image with her and just the mansion in the back. The house was originally built as a private residence. The Estate is about eight thousand acres! There is a bed and breakfast, shopping, pool, and so much more on the property. Hair and makeup ran pretty late and there was only time for a few images before the ceremony. We did most of the photos before. Neal had to plan this out good! The back of Cheryl's wedding dress was gorgeous and she really loved it! We had her face the house. That was it! You say it's very easy. No way! The Estate was still open to the public when we arrived. There were thousands of tourist walking around the courtyard. And about twenty tour buses! We did not want those in this amazing image! Neal edited out every single person and bus. It took him such a long time, but it had to be done. He also made the image a darker black and white! The color was gorgeous, but for some reason it was screaming black and white. You could see more detail in Cheryl's dress and in the main house. The ceremony was held in a garden to the side of the grounds. A tent was set up there as well for the reception! This was a dream wedding! Every image looked like a fairy tale! This image won a huge award at WPPI (Wedding Portrait and Photography International) in Las Vegas. Location: 1 Lodge St, Asheville, NC 28803.